Dennis Schoville, chairman of the Support Foundation, described Brig. Gen. Robert Cardenas’ military record during three wars, and highlighted his accomplishments in aerospace research, and his efforts on behalf of veterans. 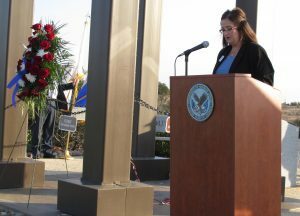 In opening remarks at the third annual Veterans Day service, Cathy Fiorelli, President and CEO of the Miramar National Cemetery Support Foundation which sponsors the service, said Americans should remember why Veterans Day is important, especially on the centennial of the end of World War I. “One hundred years ago – on this very day in 1918 – a group of military officers gathered in a railway car…on the edge of a battlefield in France. The officers represented the German Army, and the Allied armies of France, Britain and the United States,” said Fiorelli. “For four long years, warfare had raged across the farmlands and forests of France, in the air above the battlefields, and on the seas, where Allied ships engaged German battleships and submarines. Some 10 million military personnel were killed in WWI, Fiorelli noted, among them 116,500 Americans. Another 204,000 were wounded, and 4,500 taken as Prisoners of War or were missing in action. The remains of two Navy veterans of WWI are interred at Miramar: Chief Petty Officer Clyde Flynn and Chief Petty Officer Gasper Gaspellich. Cathy Fiorelli, President and CEO of the Support Foundation, asked the audience to remember the sacrifices of those who fought in WWI, which ended 100 years ago on 11 November 1918. The Veterans Day service also focused on the sacrifices of Prisoners of War. Retired Air Force Col. Ralph Kling led the Pledge of Allegiance. Kling was a prisoner of the Japanese during WWII. Featured speaker at the service was retired Brig. Gen. Robert L. Cardenas, whose 34-year career in the Air Force spanned service in WWII, Korea, and Vietnam. During WWII, he was leading a bombing raid over Germany when the plane in which he was flying was heavily damaged by anti-aircraft fire. Switzerland was a neutral country during WWII, and Cardenas was interned as a Prisoner of War in one of three camps that held mostly Allied airmen who had flown their crippled planes into Swiss airfields, or had escaped from Germany. As a captain, he was placed in charge of the internees in a camp at Adelboden that held enlisted prisoners. Brig. Gen. Cardenas survived a plane crash over Germany, months as a POW in Switzerland, wars in Korea and Vietnam, and many close calls as an Air Force test pilot during his 34 years in the U.S. Air Force. By that point in the war, some 40 damaged bombers of various types were being held by the Swiss, who had begun to repair them, and make them airworthy. The Swiss Air Force needed an Allied pilot to teach their pilots how to fly the planes, and Cardenas came to their attention. 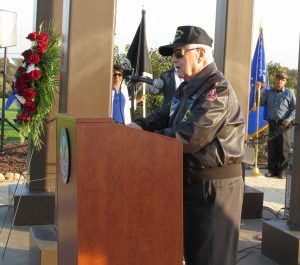 “I had the job of checking out the Swiss pilots in B-17s and B-24s,” Cardenas remembered. He also had an opportunity to visit a POW camp at Wauwilermoos, a notorious camp commanded by a brutal Nazi sympathizer whose guards badly mistreated the malnourished prisoners. “There were no beds, just planks to sleep on,” he said. “No blankets, just straw.” Prisoners were subjected to physical abuse, starvation, freezing weather, and unhygienic facilities. He reported the conditions to American authorities, but the Swiss made no changes. Eventually, Cardenas said, “I met a young Swiss lady who asked me if I wanted to leave the camp. I said, ‘Yes!’” A member of the French Underground, she smuggled pilots out of Switzerland. “She got me to France,” he said, and he arrived in Paris even before Allied troops reached the city. 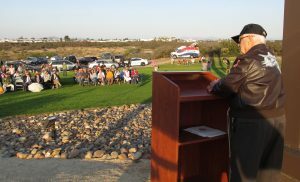 Among his many accomplishments, Cardenas is credited as a prime mover in persuading the Veterans Administration to establish Miramar National Cemetery as an adjunct to Fort Rosecrans National Cemetery. 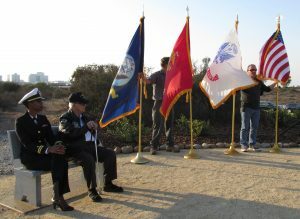 Cardenas jumped into action and, along with a small group of San Diego veterans, began a years-long campaign for a new cemetery. 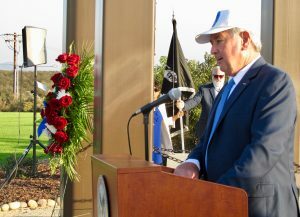 They were successful, and Miramar National Cemetery was opened in January 2010.